Bring a medium saucepan full of water to a boil. Turn off the burner, add in asparagus pieces and blanch for 2-3 minutes. While the asparagus is in the water, heat one tablespoon olive oil in a small sauté pan. Add in shallots and garlic and sauté for 1-2 minutes, just until tender. Drain the asparagus and rinse with cool water. 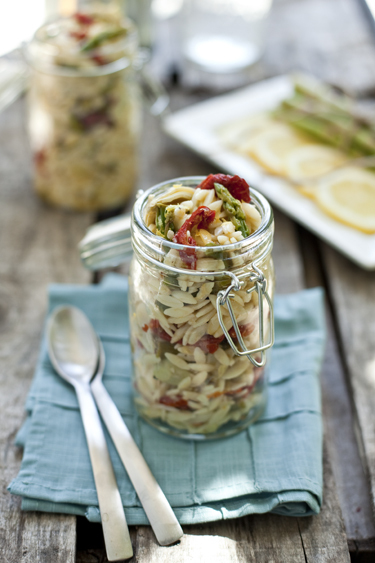 In a large bowl add cooked orzo pasta, asparagus pieces and sautéed shallots and garlic. Drain artichoke hearts and quarter them, adding them to the bowl. Add in sun-dried tomatoes with oil and lemon zest. Stir to combine. In a small bowl or container, whisk together lemon juice, white wine vinegar, salt and pepper. While continuously whisking, slowly pour olive oil into the vinegar. Once emulsified, stir the dressing into the salad. Move to the refrigerator for at least 5 hours for flavors to combine. Serve cold. Preheat the oven to 325 degrees Fahrenheit and add cupcake liners to a cupcake pan. Grind the gingersnap cookies until almost finely ground (it's OK to leave a few medium chunks, if you'e a lover a little crunch!). Combine the gingersnap cookie crumbs, pure cane sugar and melted butter in a small bowl and mix with a spatula until well incorporated. In a large bowl, mix together on low speed in an electric mixer, the cream cheese, pure cane sugar, and flour until combined. Be sure to scrape the sides of the bowl if needed. Add the sour cream and mashed bananas and continue to beat on low speed until well combined. Next, add the vanilla extract and the first egg and beat slowly until mostly combined. Then add the remaining egg and mix until well combined. Add a pinch of cinnamon at this point, if desired (I always love taking flavor to another level). Add additional filling on top of the banana slices, filling each cup until 3/4 full. Bake the cheesecakes for 18-20 minutes, then turn off the oven and allow them to sit in the oven for another 5 minutes. Remove cheesecakes from the oven door and allow them to continue to cool for another 15-20 minutes, then put them in the refrigerator until ready to be served. Add the heavy whipping cream, powdered sugar and vanilla extract to the mixing bowl of an electric mixer (w/ a whisk attachment) and whip on high speed until stiff peaks form. Then, add whipped cream to a pipping bag. 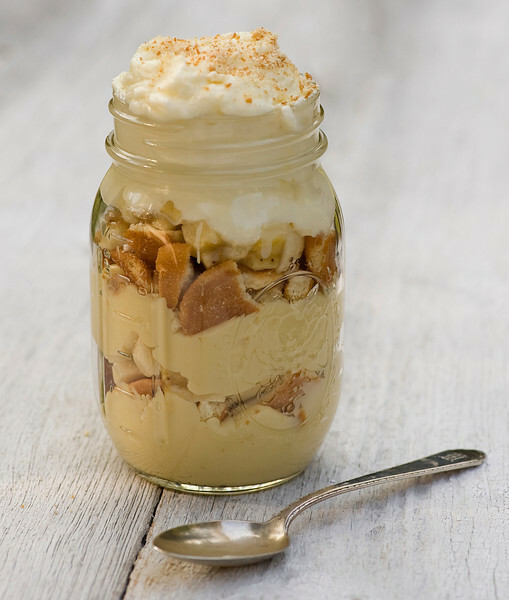 Once cooled, remove cheesecakes from cupcake liners and pipe a swirl of whipped cream on top of each cheesecake and with a banana slice and vanilla wafer cookie. Repeat until complete. Crumble a few vanilla wafer cookies in your hand and sprinkle atop cheesecakes, if desired. Refrigerate again, until ready to serve. Bon Appetite! Cheesecakes are best when well covered and can last for 2-3 days. Make pudding: whisk the egg yolks, sugar and cornstarch together until smooth and set aside. Heat the milk in a medium sized pot until boiling. Remove from heat, pour into a measuring cup and pour in a slow stream into the egg mixture, whisking constantly. Pour the milk mixture into a clean pot and whisk over medium heat until it thickens. When it starts to thicken it will go fast, so whisk whisk whisk so you don’t get lumps. Spoon the hot pudding into a bowl and add the vanilla and butter. Whisk until the butter is melted, cover with plastic wrap and refrigerate until cool, at least 2 hours. When pudding is cool, assemble in either single serving dishes or a medium serving bowl as follows: half the pudding, half the cookies, half the bananas. Repeat with remaining ingredients. Make the whipped cream by whipping the cream and sugar together until the cream forms medium soft peaks. Spoon cream onto the top of pudding, sprinkle with cookie crumbs and serve! Place melting chocolate in microwave for 1 minute. Stir and place back in microwave for 30 seconds at a time until chocolate is smooth. 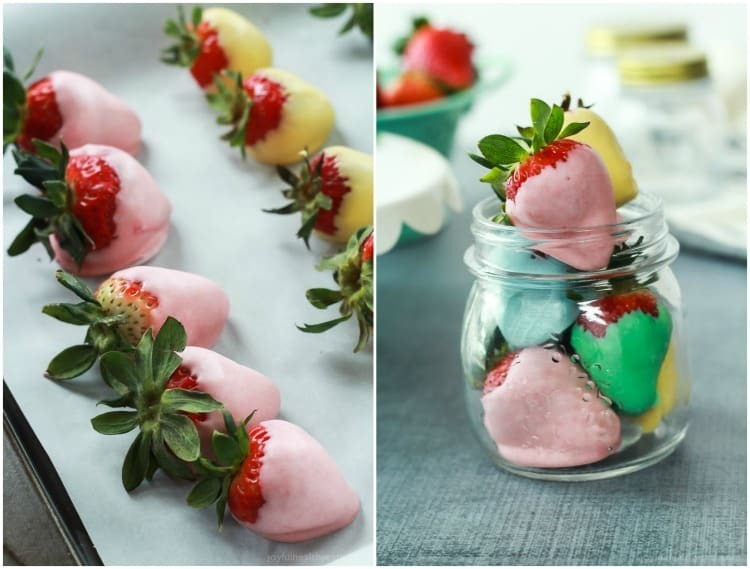 Dunk the strawberries in the desired chocolate color and place on lined baking sheet to hardened. Place in refrigerator for 1-2 hours and serve! Flake together the flour and shortening. Tip:The method of flaking the flour and shortening is to use a pastry blender or two knives, cutting and tossing the ingredients together until the shortening pieces are the size of small peas. This next step is the magic touch: stir in evaporated milk and salt to the flour/shortening mixture. Stir together until the mixture begins to cling together and can be formed into a ball of dough. Cut dough in half and place one section on a lightly floured surface. With a rolling pin, roll the dough lightly; rolling the dough from the center out. Turn the circle of dough over, lightly flouring the surface between turns (this keeps the pie shell from puffing up and then shrinking). 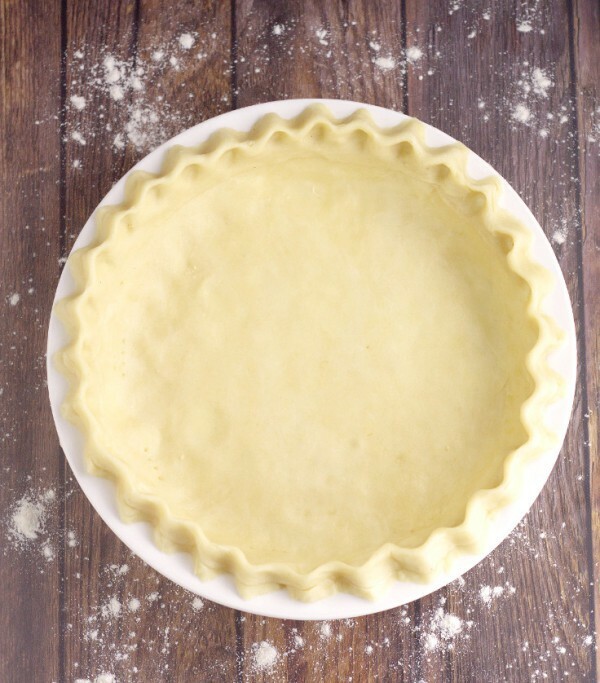 Place rolled dough in a pie pan and pinch the sides together around the edges or prick with a fork (as displayed). Prick the bottom and sides of the shell with a fork. 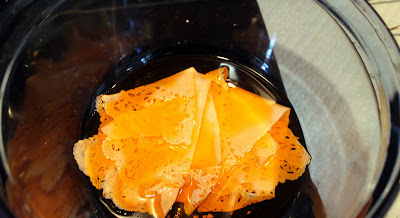 Mixing together 2/3 cup dry soy or rice milk powder with 3/4 cup water will yield 1 cup evaporated milk. Use at a 1:1 ratio for evaporated milk called for in a recipe. Take an 8.5 x 11 sheet of orange paper and cut it in half. I tried this with card stock and regular paper and it worked great with both. Fold into a cone and secure with tape. Fold down the tallest corner first and then fold down the other sides until the top is closed. 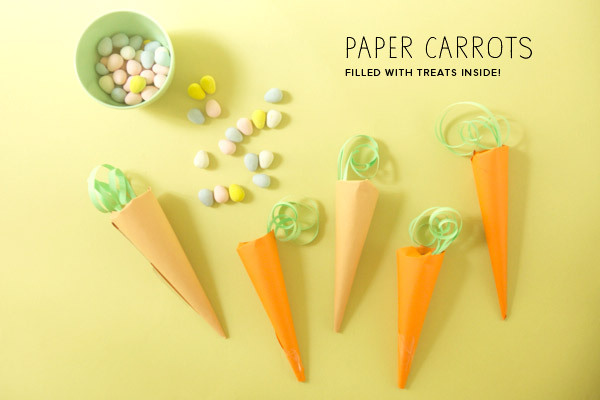 Cut strips of green paper and tape them to the top of the carrot. There was once a couple named Barbara and Adam Maitland. The couple died in a car accident and became ghost. They were doomed to haunt their country side residence and unable to leave the house. Meanwhile, a couple with the last Deetzes moved into the house with their teen daughter Lydia. The original owners the Maitlands try to scare the family away but they are unsuccessful. What happens next???? Does the story sound familiar??? Beetlejuice, Beetlejuice, Beetle....... Oh Oh may have been the name of the movie but I fell in love with the teenage girl character. No matter who the character was that was the best the movie Beetlejuice turns 30 this year. I have many memories of my mother making a casserole made from canned soup. In fact it was one of the first recipes I turned to when I sat up house of my own. Since that time I have made a few different times raising our family , seeing them all leave, then they came back and brought their own children. Poach the chicken. Place chicken in a single layer in a deep skillet and cover with water. Add a pinch or two of salt. Bring to a boil, then cover, reduce heat and simmer for about 10-12 minutes. Check the chicken to ensure done-ness. It’s done when it’s no longer pink inside. Meanwhile, chop the onions, carrots and celery, and cook pasta according to package directions. (I like to under-cook pasta that will be baked, by about one or two minutes.) Drain and set aside. Once the chicken is cooked, chop it into bite-sized pieces. Set aside. In a large skillet melt butter. Add onions, garlic, carrots and celery and cook until onions are translucent. Add both cans of soup and mix well. Add sour cream and mix well. Season with salt and pepper to taste. Add chicken, noodles and parsley and mix well. Spoon into a greased 13 x 9 inch baking dish. Bake uncovered at 350 degrees for 30 minutes. Sprinkle crushed crackers on top and bake for an additional 5-10 minutes. 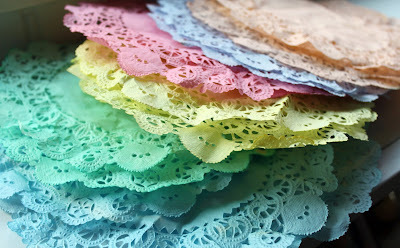 Dry the doilies on a wire rack. You may want to dry them hanging on a clothes line. 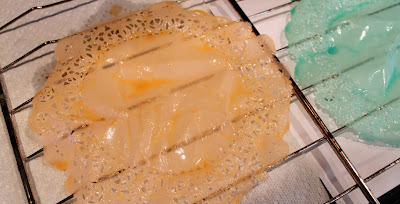 It is best to unball the doily under the liquid. 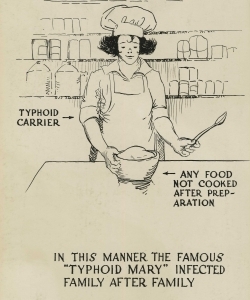 Those in the food industry may well know the story of Typhoid Mary. The story goes that a young servant cook working for affluent families in New York City during the 1900s was the first individual in the United States to be identified as an asymptomatic carrier of the pathogen associated with typhoid fever. This young lady named Mary was healthy as could be but several outbreaks where people were infected with typhoid fever was present in the community. Mary was thought to have caused at least 51 infections and at least 3 deaths. The reason the bacteria associated with typhoid fever is also known as Salmonella typhi. This should be a warning to all food servers. Many diseases that can be passed on by food handlers. Everyone should be considered the transmission of illness between sick food handlers and other food handlers. The food business is vulnerable if all the staff are off sick because one food handler spread germs to the co-workers. This horrible event took place on March 27, 1915 in New York. 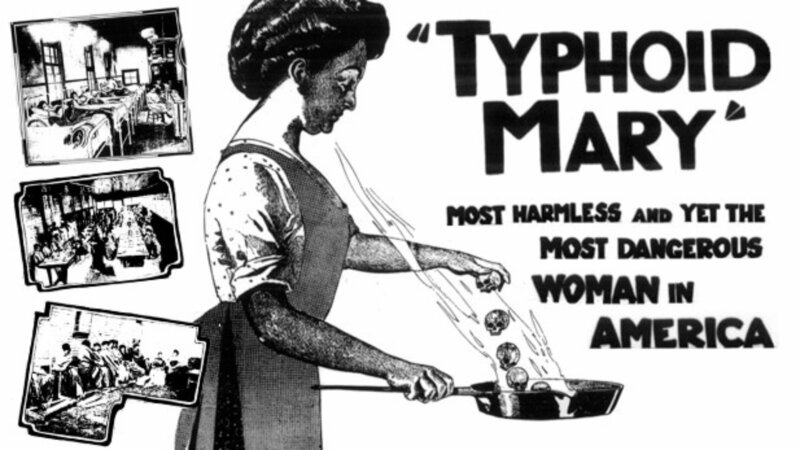 The New York city health officials quarantined the 45 year old woman "Typhoid Mary" for the second time after a previous typhoid fever outbreak. 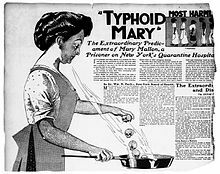 The story of "Typhoid Mary" is well known but little is known about the life of Mary. 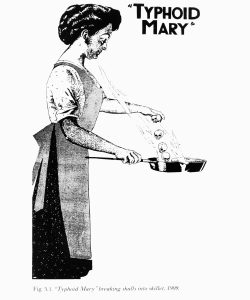 Mary Mallon was born September 23rd 1869 in Cookstown, Ireland. It was among the poorest areas in Ireland. While Mary's story is well known she was not the most lethal carrier of the typhoid germ in New York City's history. Mallon never experienced the symptoms of Typhoid fever. These symptoms included fever, headaches and diarrhea. It seems that Mary was immune to the disease but was a carrier of the illness. The family of the wealthy banker Charles Warren and his family would contact typhoid fever while vacationing The individual who owned the vacation home hired George Soper a freelance sanitary engineer to determine the cause of the Typhoid fever. Everything from the vacation house and plumbing to local shellfish supply was investigated with all coming up negative for the fever. The cook Mallon would be found to have typhoid fever and had also passed it to 7 other families as well. Mallon and her poor hand washing before handling food was found to be the culprit. The high temps needed to cook the food should have killed the bacteria the issue was how was the germs transferred. It was found to be the peaches in the ice cream. Mallon was arrested in 1907 and she was forced into confinement. Living this leper like life Mary would sue the health department for her freedom in 1909 but her petition was denied, that is until she hired a lawyer. It is believed that William Hearst helped bankroll the struggle to get Mary out of confinement. It was agreed to release Mary if she never cooked again and stayed out of the kitchen. Mary did not keep her promise and this was noted with another typhoid fever outbreak in 1915. She was working at a Maternity Hospital and had been nicknamed "Typhoid Mary" Mallone had changed her name and was now Mary Brown and had worked under other names cooking at hotels, restaurants and institutions. She was recaptured and returned to the island to live as a leper. There she would live until her death in 1938, a some 23 years in isolation. One American Singer and Songwriter celebrated a birthday today, March 27th. At the age of 21 years of age she signed with Columbia Records and released her debut album, Mariah Carey (1990) This album would be the first with 4 number one singles to hit U.S. billboard hot 100 chart. Carey was married to Sony Music Head Tommy Mottola. She became the label's highest selling act in the mid 1990s. Carey would divorce Mottola and change her image and add a bit more hip hop into her music. Carey has sold more than 200 million records worldwide. The third best selling female artist in the United States with 63.5 million albums. VH1 named Carey was ranked #2 out of 100 greatest female artist in music history. Her winning list includes 5 grammies, 19 world music awards, 10 american music awards, and 14 billboard music awards. Mariah Carey continues to influence young singers. Today March 27th is National American Diabetes Association Alert Day. The day occurs each year on the fourth Tuesday in March. It works as a "wake up call" and helps to inform the American public about the seriousness of diabetes. It helps to encourage all to take a diabetes risk test and learn about family history and the presence or not of diabetes. In 2001 I was diagnosed with diabetes. The diagnoses was made through a blood test during a health check up. It was surprising to me but it really should not have been. Diabetes was very much present in my family history. A few years later my own son was diagnosed with the disease. 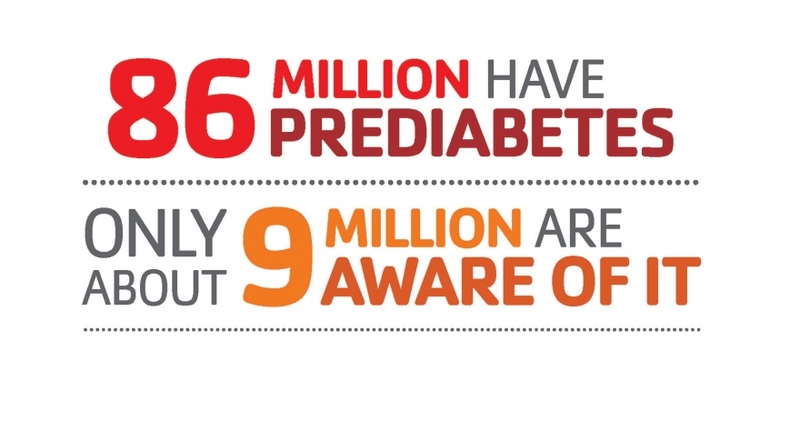 There are most likely many maybe you that may suffer from diabetes but not know it. 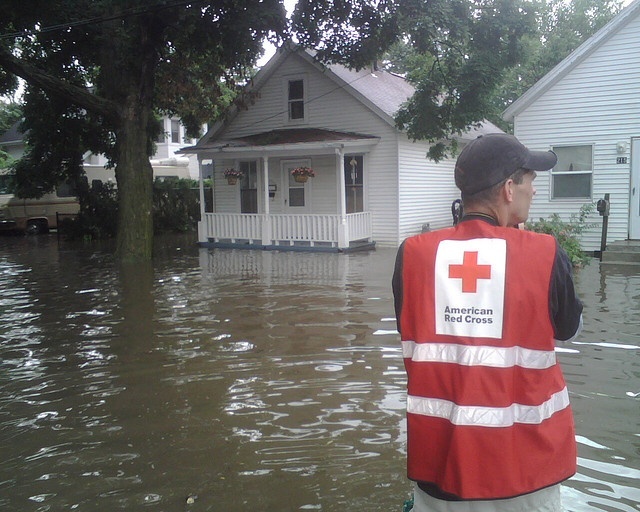 Most of us have heard about the American Red Cross but exactly who are they?? support for the military members and their families. Spring is peak season for tornado activity. Warm spring days seem to call up tornado's that occur between 3 to 9 pm. Don't forget though tornadoes can occur any where, any time of the year, any time of the day. 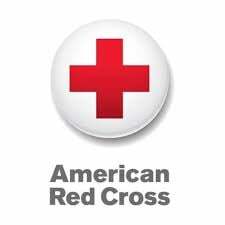 These safety steps should be read so that you are ready if a tornado warning is issued in your neighborhood In addition the Red Cross has a tornado app that can be downloaded from their website and used on your mobile devices. 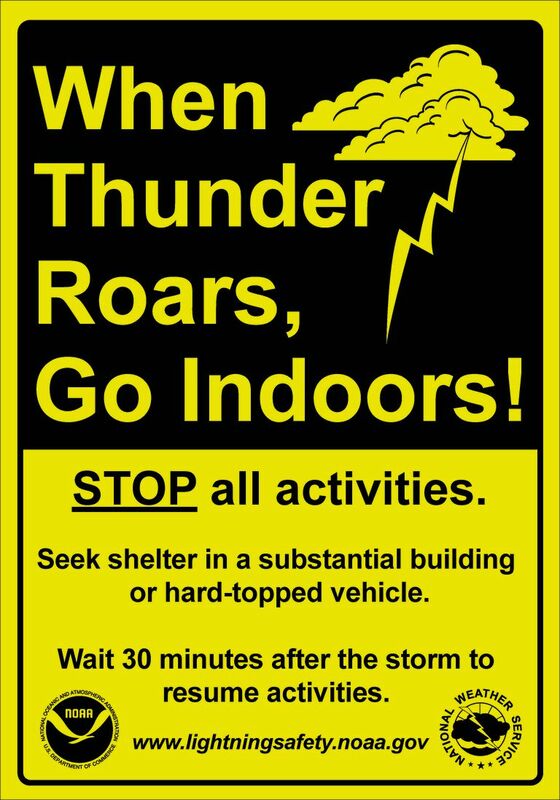 storms with darkened skies, flashes of lightning or increasing winds are signs that outdoor activities should be postponed. Baths, showers and any other uses of plumbing should be halted til storm is over. stay away from floodwaters Flowing streams where water is above your ankles should be a sign to stop and turn around. Six inches of swiftly moving water is all it takes to sweep you off your feet. If you are driving and come upon a flooded road, turn around. If you are on a road driving and waters suddenly start to rise get out of the car and move to higher ground. Cars are easily swept away by less than 2 feet of moving water. 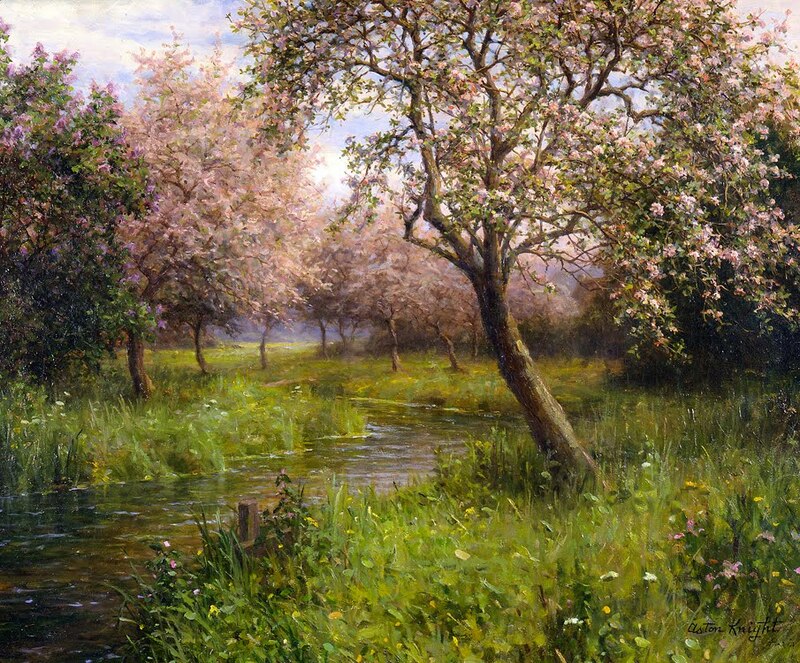 Robert Frost was born in March of 1874. He is a well known American poet. He shares the stage of literature with Mark Twain on his stand of Christianity. He questions the beliefs of those where only a "chosen few" are predestined for "eternal glory"
In 2008 a special day known as Purple day was created by Cassidy Megan. She was motivated by her own personal struggles with epilepsy. Her goal was to make epilepsy the topic of conversation. She desired to help educated individuals on the truths about the epilepsy and help inform all that would listen that they are not alone. 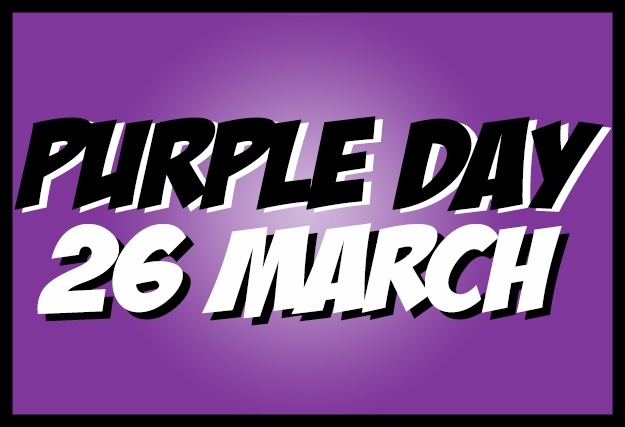 When the Epilepsy association of Nova Scotia joined in the cause the day became popularly known as Purple Day. There is around 50 million people living with epilepsy around the world. That estimates to be that 1 in every 100 people have epilepsy. More than 300,000 Canadians live with epilepsy and 2.2 million Americans live with epilepsy. Epilepsy is not contagious and it is not a disease or psychological disorder. There is no cure for epilepsy but there is help for some that struggle with seizures. Medication can help control the seizures It is possible for some children to outgrow epilepsy and some adults may have spontaneous remission. In March we recognize strong women both in the past and present. There is one great lady that I first heard about while I was attending high school. Her name is Sandra Day O'Connor. 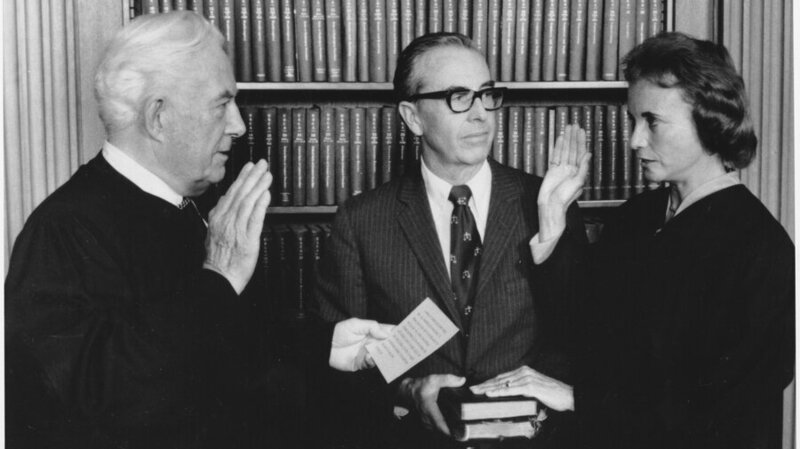 Sandra Day O'Connor was born March 26th, 1930. She is a retired Associate Justice of the Supreme Court of the United States. O'Connor was first appointed in 1981 to the seat by Ronald Reagan. She was the first to serve on the court. 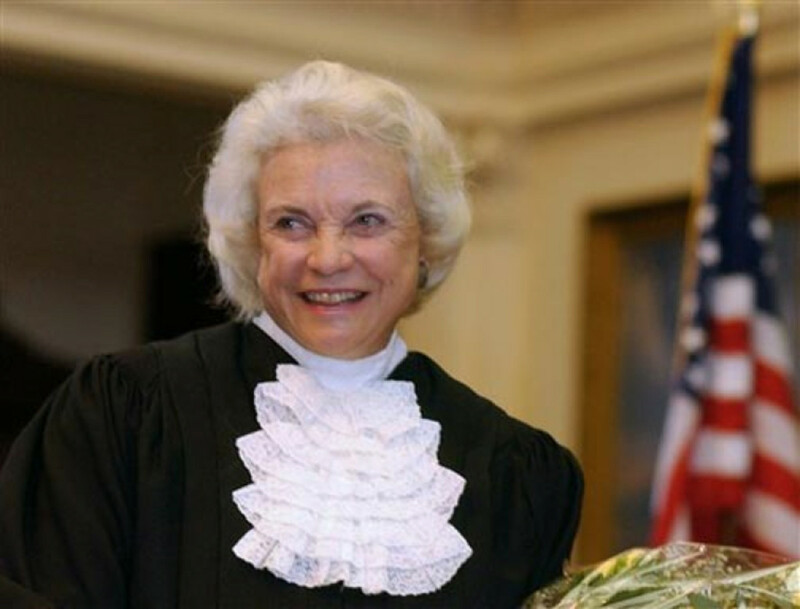 Sandra Day O'Connor had served as an elected official and Judge in Arizona serving as the first femal Majority Leader of a state senate as the Republican leader in Arizona Senate. When she was nominated for the Supreme Court seat the Senate unanimously accepted her. She served on the Supreme Court til 2006. Some of the important cases she resided in was Planned Parenthood v. Casey , Bush v. Gore and Grutter v. Bollinger. O'Connor was Chancellor of The College of William & Mary in Williamsburg, Virginia, and served on the board of trustees of the National Constitution Center in Philadelphia, Pennsylvania. She also served on the Board of Trustees for Colonial Williamsburg. Several publications have named O'Connor among the most powerful women in the world. On August 12, 2009, she was awarded the Presidential Medal of Freedom, the highest civilian honor of the United States, by President Barack Obama. Slice one waffle in half and use for the ears. Slice another waffle in half and use 1 part for the shoulders and then cut out 2 circles for the cheeks. Add the strawberry slices and place on top of the ears to fill in. Assemble the face and bow tie. Read Matthew 21:1-9 Jesus was coming to Jerusalem for Passover. Some people cut palm branches from trees and handed them out for people to wave. Some people laid their coats on the street like a carpet. Jesus rode into the city on a donkey. “Hosanna! ” the people cheered as they waved their palm branches. Some people cheered, “Hail to our King!” Jesus rode through the town on a donkey because when a king rode on a donkey it meant he would bring peace. God loves us so much that He sent Jesus to set us free and bring us peace. Let the children eat the piece of cracker. (Use a gold fish, a ritz bitz, or any cracker your child likes) Matthew 26:17-19, 26-30. Jesus and His disciples (the 12 men who helped Jesus tell others about God) celebrated Passover together. They went upstairs to a room in a house in Jerusalem. Jesus washed His disciples’ feet to remind them that they were to care for others. Then Jesus and the disciples shared a special meal. Jesus knew it would be His last meal with His friends. Jesus knew He had to follow God’s plan for His life and die for our sins. Matthew 28:1-2 After Jesus died one of his followers wrapped Jesus’ body in cloth and put it in a tomb. The tomb was a special tomb cut into the rock in a hillside.. A big stone was rolled in front of the tomb to close the entrance. Guards were posted to guard the tomb. Jesus followers were very sad that Jesus had died. Matthew 28:5-8 Early the next morning a lady named Mary Magdalene went to visit the tomb. When she came to the tomb the big rock had been rolled away. The tomb was empty. It was good news! Jesus was alive! Jesus went to heaven to be with God. Jesus was punished for our sins so that some day we will get to go to heaven to be with God and Jesus. Cowboy caviar is very much like Texas caviar in that it is a salad of black eyed peas that has a vinaigrette style dressing. This is a great dish for company as it is a snack many can enjoy and can be served with tortilla chips. This recipe can be made ahead of time , froze and served whenever you need it. Divide among indicated 3 quart sized freezer bags. Label and freeze. In most cases the first step is to boil eggs. This is normally the first step in most egg dying projects and is no different in this one. After boiling eggs place them in a paper carton. The eggs will be hot. Warn the artist whether big or small that they are hot / warm. Now it is time to get artistic with crayons. Let them start their design. The crayon wax will melt right in allowing the designs to be one of a kind. Try wrapping your egg with different sizes of rubber bands and dipping in the first color of dye. Place several hard-boiled eggs in a colander in the kitchen sink and splash them with the vinegar. Drip yellow food coloring on the eggs. If you have the tradition of dyeing Easter eggs then you most likely are a dyer. As for me I love to dye Easter eggs. 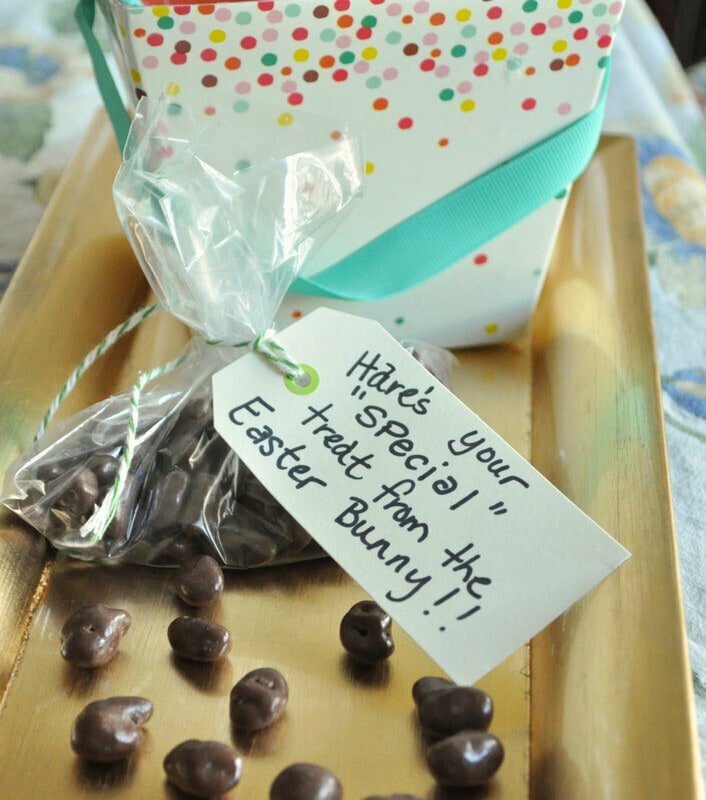 It is an Easter tradition that has been passed down through the years. 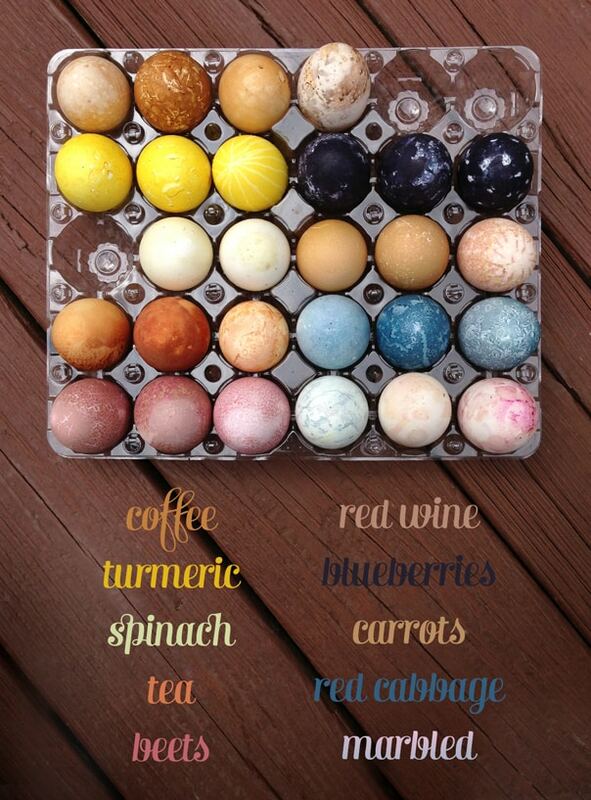 There are many ways to dye or color eggs. 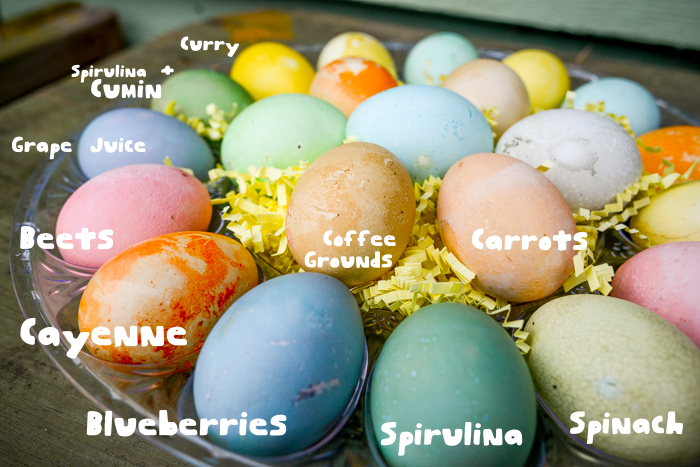 One fun way as well as scientific natural way is to color eggs using natural dyes. Start with raw, white shelled egg.s Place eggs in pan in a single layer. Cover eggs with cold water. Bring water to boil, reduce heat and simmer 15 minutes. In another bowl add 1 teaspoon of white vinegar. You will need a bowl for each natural dye you plan to use. 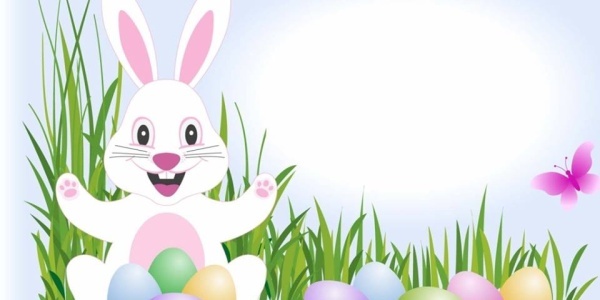 The more eggs you are dying the more dye you will need to use. The more dye you use the darker the color will be. Take a slotted spoon to see if the egg is desired color. If the egg is ready take the hot dye liquid and rinse eggs in cold water to stop eggs from cooking. Change the water til it stays cool in fridge. 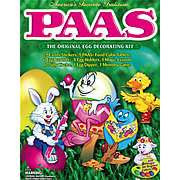 I think it is great for those who think they are too old for the traditional Easter basket. They will also serve to give someone a smile when they need it. A few chocolate covered raisins are all it takes and your imagination can go wild.